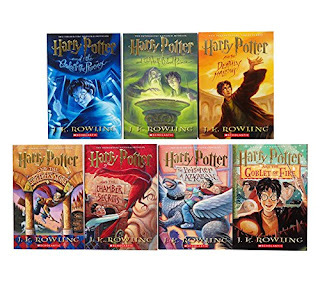 The Harry Potter books, by J.K. Rowling, will always have a special place in my heart. These books are just delightful. I thoroughly enjoyed them when I read them with the kids, and I'm now listening to them (narrated by Jim Dale, who is the Bomb Diggity) and enjoying them all over again. But that's not why they have a special place in my heart. This series was one of Moe's all-time favorites. She and I were both Ravenclaws, and we had that in common, even when we struggled with our relationship. She read them again and again, and couldn't wait for the next book to be published so she could find out what happened next. The last book was released while we were in Oklahoma for a family reunion, and in order not to waste any time, she convinced her Grandma to take her to the book store at O-Dark-Thirty in order to get her copy. She then spent the rest of the day with her nose buried in it, until she had finished it. Because that's who she was. I don't reread much anymore. With so much new and interesting content available, I don't really see the point. But I will come back to these stories again and again, because they remind me of my Moe-Moe, and make me happy.